whose innovative business ideas seek to address salient, community-based development challenges. ​Tanzania is a rapidly developing nation, with an annual economic growth rate of approximately seven percent. The country’s largest city, Dar es Salaam, has the ninth fastest growing population in the world. Naturally, this rapid influx of people has led to a greater demand for jobs and services. One way to tackle this economic challenge is through the creation and fostering of localised small businesses– using a model of human-centred design to address issues related to healthcare, energy, and more. However, there is a lack of entrepreneurial culture among students, as the Tanzanian education system does not encourage students to think creatively, even at the University level. ​Creative and driven individuals are needed to develop ideas. The social enterprises they develop boost the internal development of the city and foster local economic diversification and growth. ​The course’s aim was to equip students with the relevant business, social and personal skills to succeed as entrepreneurs. At the same time, the programme worked to tackle some of the problems facing Tanzania across three areas: Water, Sanitation & Hygiene (WaSH), Manufacturing & Urban Living, and Off-grid Energy. It ended with a sold-out conference, bringing our students together with industry experts and other innovators, who all shared the vision of using ‘impactful innovation’ to improve Dar. Businesses formed during the programme had the opportunity to pitch to audiences of several hundred people, with a chance to receive seed capital for their ventures as well. The theme of ‘Impactful Innovation' acted as a constant reminder of the importance of seeking sustainability, improvement and creativity. With over 200 applicants to the Summer 2017 course, CDI’s Entrepreneurship team in conjunction with the University of Dar es Salaam was able to host 45 Tanzanian students, supporting their development as social entrepreneurs over the course of the programme. Following the well-attended end of course conference, the three prize-winning business ideas received seed capital of between $1,000 and $3,000 to jump-start their work. In 2018, after several years of development, implementation, and careful monitoring & evaluation, the CDI entrepreneurship course model was transitioned into the hands of Tanzanian partners (DOT and UDSM). Under their direction, the course has been expanded and conducted on a much larger scale than CDI’s limited structural capacity allowed. This transition represents the culmination of CDI’s efforts to achieve sustainability and scalability in our development initiatives. As the DAREnterprisers course has been handed over, the 2017-2018 Entrepreneurship team researched, developed and piloted a new project: Into Business. The Into Business programme involved a series of free stand-alone seminars throughout the summer that aimed to teach participants the key skills they will need to succeed in business. These ranged from CV writing and interview skills workshops, to seminars on business ideation, business registration, law and tax, and raising capital. In addition, several inspirational speakers ran seminars to share their success stories. A highlight was Benjamin Fernandes, a well-known Tanzanian businessman and national TV personality, giving an inspiring seminar attended by over 90 participants! 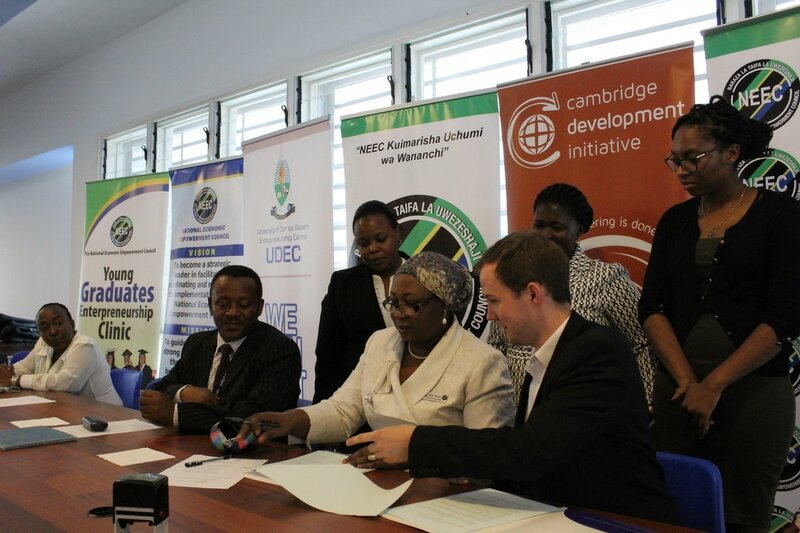 In particular, the project aimed to focus on women’s empowerment in the business sector. The structure of DAREnterprisers resulted in few women participating in the programme due to cultural and logistical challenges. Therefore, Into Business aimed involve, represent, and empower young women by employing a structure that is more sensitive to their needs. Participation of women was increased through reduced time commitments and accessible locations, gender mainstreaming in curriculum content and the speakers who delivered it, as well as targeting young women directly through contacting NGOs focused on women. In particular, a seminar run by Khalila Mbowe on “Gender Equality in Business” was extremely inspirational and empowering. For the 2018-2019 cycle, the impact of the 2018 Into Business programme will be assessed and a decision will be made on whether it will be continued. If so, there will be a focus on how to increase impact via improved attendance and access, a more defined target audience and refined curriculum based on feedback from this year, better interactivity in seminars and enhancing the digital resource bank that complements the seminars. Furthermore, research and development of other pilot projects may be considered for the upcoming year, including proposals about a student consultancy involving teams of professionally trained students pairing up with local businesses to maximise their entrepreneurial success.